As he prepared for another round of annual U.N. climate change negotiations a few weeks ago, the Philippines' lead negotiator, Naderev "Yeb" Saño, was upbeat about the prospects for the global talks. The soft-spoken activist-turned-diplomat, who shot to fame in the climate world for delivering stirring appeals for action at the United Nations and leading the largest global-warming fast in history, was humble about his role and focused on others. He had just returned from 40 days of walking from the capital of Manila to Tacloban, the town that bore the brunt of last year's devastating Typhoon Haiyan. His feet could not stop moving -- Saño said he was still walking 5 to 10 kilometers a day out of "habit" -- and his mind was still with the men and women he met along the way. "It was an amazing journey. I've never seen my own country in that way. I learned a lot from people who have confronted not only climate struggles, but economic struggles," Saño said via Skype from his home. He spoke of women whose families' livelihoods depended on crafting woven mats from materials all but wiped out by Haiyan, and now are unable to make ends meet. He recalled meeting poor farmers in the Philippines' typhoon belt who insisted he accept their freshly picked vegetables as he walked through town. "They went out of their homes and they gave us their produce, the vegetables they just harvested. That really floored us," Saño said. "They just harvested it, and they were supposed to sell it in the market to make ends meet." Saño dedicated his 1,000-kilometer walk to Haiyan's victims and said he was eager to relay the experiences of those he met to the thousands of delegates gathering this week and next in Lima, Peru, for U.N. negotiations. "We will definitely be telling these stories to the whole world," he said. But Saño has been a no-show though this first week of talks in Lima, sparking confusion and outrage among his many followers. Saño indicated in his Nov. 19 interview with ClimateWire that he would be attending the second week of talks only, and a source close to the delegation said he has been cleared to arrive at the talks this week. Supporters, though, worry that the Philippine government is trying to distance him from the negotiations. 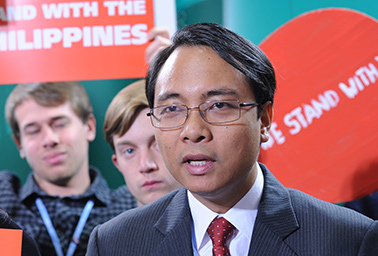 Naderev "Yeb" Saño, lead climate negotiator for the Philippines. Photo by Alik Keplicz, courtesy of AP Images. Saño has not responded to follow-up requests for comments but has issued a number of cryptic tweets this week, declaring, "If my silence is not understood, then my words will be meaningless." Mohamed Adow, a senior climate change adviser for Christian Aid, lamented Saño's absence and called it "curious given the significant leadership role he has played at these talks in fighting for the rights of people suffering from climate change." "He is a ray of light in an often dark process, and I hope he has not been excluded from the delegation because some people don't like the important truth he tells," Adow said. But while activists imply that Saño was sidelined for speaking truth to power, others say the truth is a little messier. Not only have leaders in the Philippines' government been uneasy with Saño's rock-star status, but his outspokenness has also exposed internal rifts over how the country wants to position itself in the U.N. talks. The controversy surrounding Saño's absence is closely linked to the Philippines pulling itself away from a hard-line coalition of countries known as the Like Minded Developing Group. Formed a few years ago, the bloc's biggest members are China and India, but its positions are dominated by large oil producers like Venezuela and Saudi Arabia. The group occupies an unusual spot in the world of climate politics, where activists are loath to publicly criticize any developing nation. Its members have been embraced by social justice movements for impassioned demands that wealthy countries take full responsibility for curbing emissions and helping poor countries. Last year in Warsaw, Poland, Saño made a plea to other diplomats to "stop the madness" and make faster work of cutting carbon. But behind the scenes, those close to the delegations say, members of that alliance have used procedural tactics to stall movement in the U.N. and quashed efforts that the Filipino government supports, such as setting a long-term goal for peaking global emissions. The Philippines' caucusing with the Like Minded Developing Group has always been curious. The Philippines is one of the world's most vulnerable countries -- the German think tank Germanwatch just put it at the top of a distressing ranking of countries suffering from extreme weather events. It is bracing for another whopper typhoon, called Hagupit, which is likely to strike this weekend with winds over 150 mph. It's also a growing leader in renewable energy, the world's second-largest producer of geothermal energy for power generation and opening itself up to hundreds of megawatts of solar energy in the coming years. Asked about the alliance by ClimateWire this spring, Saño was brutally frank about what he described as the Philippines' dual "national interest" in curbing climate change but also protecting the wealth of Arab oil-producing nations. "You also have to realize that more than 10 million Filipinos live abroad, and most of them live in countries that depend on the economies of oil-producing countries. That is something that is a very real concern," he said (ClimateWire, April 28). "Until we are ready to bring our folks back home, we do have a stake in this very complex issue of how we respond to climate change, the measures that we take to respond to climate change. That is a very real concern for us, not just in a diplomatic sense but for the welfare of the very Filipinos who work abroad." The U.S. State Department denies prodding the Philippines out of the Like Minded Developing Group, despite widespread reports to the contrary. Saño, for his part, declined when he spoke to ClimateWire last month to talk about the pressure he faced to distance himself from the bloc, saying merely, "I can't speak for that group right now." Instead, he remained optimistic about the negotiations and said that the recent announcement between the United States and China to jointly move forward on unilateral carbon cuts will boost the entire process. "This has huge potential to change the game," he said. "It inspires all countries to have greater trust in one another."